This week’s post is the final part of a blog series presenting examples of widely-held beliefs about four topics— dietary fats, cholesterol, sugar, and exercise –that I suggest need to be revised and updated. This is important health information that Americans should be educated about to reduce the rising rates of obesity and diabetes in the US. It is time we revisit the role of exercise. In almost every book on weight management, exercise is usually mentioned as the key to losing weight and keeping it off. On the surface, you would think this makes sense. When you exercise, your muscles burn fat stored in your fat cells. Young people do lose weight with exercise as a tool. However, when it comes to adults, my opinion is that it is possible to lose weight through exercise and, in the process, reduce your blood sugar levels and prevent or reverse prediabetes, however, it is not probable. Most adults cannot rely on exercise as their primary method to lose weight. Why? First, most people simply do not exercise and burn enough calories relative to one’s daily intake. A woman weighing 140 pounds may expend 270 calories by walking 3.5 miles in one hour, 390 calories by riding a bike for one hour and going a distance of 10 to 12 miles, or 430 calories by running 30 minutes at a speed of 7.5 mph. 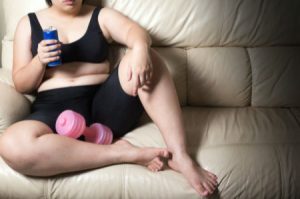 But if she is doing one of these forms of exercise only two or three times per week, all the while consuming 1800 or 2000 calories per day, she will hardly make a dent in depleting her fat cells. The same goes for men, although the numbers are slightly different. Another problem with exercise is that it does not have the same impact on weight loss as you age. It is very difficult to keep up the level of activity needed to maintain a negative calorie intake when you have aging muscles. What used to take 20 minutes to burn 300 calories now takes 40 minutes or even an hour since there is a gradual decrease in the ability to maintain skeletal muscle function and mass. Exercise is valuable for one’s health, but not for weight management. Physical activity is vital to the body, starting from childhood. The primary objective of exercise is to condition the lungs, heart and muscles, regardless of your body weight. Conditioning develops reserve capacity available for use when you need it or when you become sick. For example, an older person who does not exercise may have the capacity to deliver one liter of oxygen per minute to the tissues and a reserve capacity of three to four liters per minute. An athletically fit old person may have twice that much reserve. When an athletically fit older person develops a condition such as pneumonia, he or she has more available respiratory reserves. The same is true of a conditioned heart in an athletic older individual—it can pump more blood with less effort than an unconditioned person and has the reserves to help that person through a serious illness. Additional benefits of exercise come from improved blood circulation which helps the brain to think more creatively and the skin to have a better tone. The sustained elevation of body temperature you get from exercise also improves the immune system and defense mechanisms of the body and makes it easier for the transfer of glucose from the blood into active muscle cells. For many people, the addition of exercise in their daily routines also offers the key to greater psychological happiness and wellbeing, even if they are gaining weight. If you are diagnosed with prediabetes or diabetes, exercise can help your muscles burn more fatty acids as well as glucose thereby reducing their levels in your blood. So please do exercise, but don’t view it as your key to losing weight. If you found this series enlightening and would like to demand the suggested nutritional guidelines be revised, talk to your doctor next time you go into a visit. We must demand the changes we need from the medical community. According to statistics compiled by Centers for Disease Control and Prevention [CDC], between 1990 and 2010, the number of Americans living with diabetes tripled and the number of new people being diagnosed with diabetes annually doubled. The Institute for Alternative Futures has also updated its projections, suggesting that almost 55 million Americans have diabetes, the vast majority being Type 2. By 2030, with an estimated 1.5 million people newly diagnosed with diabetes every year, the total annual medical and societal cost related just to diabetes is expected to rise to $622 billion. Despite all the efforts made by diabetes experts, dietitians, clinicians, researchers, diabetic educators, nurse practitioners and regional and national diabetic associations, the incidence of Type 2 diabetes keeps increasing as does the financial burden on the nation. This is a serious conundrum.